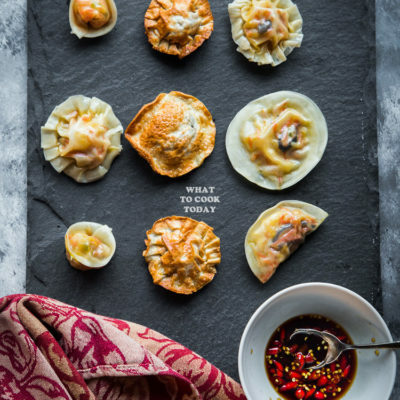 Colorful vegetables and shreds of omelets are stuffed inside these dumplings served with soy-vinegar dipping sauce. Yin dumplings are steamed and the Yan dumplings are shallow-fried. These are seriously so good! For flower pleats, starting from one end of the wrapper, slightly fold over the edge (like a pie crust) and continue folding around the dumpling. Repeat this process with the remaining wrappers and filling.